First, this isn’t meant to be a specific race review. I have run three Ragnars so far. 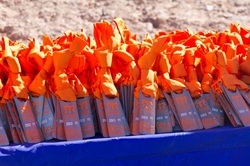 I have run the Las Vegas road Ragnar twice, and I have run the Ragnar Trail Relay at Zion. 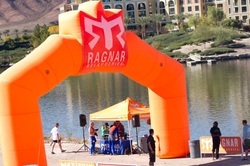 “Ragnar is the overnight running relay race that makes testing your limits a team sport. Yeah, a Ragnar seems crazy (and it is). People (especially non-runners) wonder how something like that can be fun. But it is! For the Ragnar Trail, it involves 8 runners (4 for ultra), fewer miles, camping, no vans, and trail running (duh). You don’t do a Ragnar Relay to set any PRs. Your team is timed but individual legs are not timed. Add in the fact that you have to run three legs and the distances vary, then you realize you aren’t setting records like your normal races. It is more than a fun run though. Sure, there are decorated vans, crazy costumes, and teams with themes. There is still the friendly competitive element to it. You cheer random people on but you also try to beat them. Many vans tally their kills (when a runner passes another runner). This also makes it the perfect race for everyone. Both experienced and new runners can push themselves in speed and/or distance. If you’re a marathoner (which is why I assume you’re on this website), you’ll do just fine. It is an overnight relay. If you do not do well with lack of sleep, this may not be your thing. By that third leg, you may very tired, sore, worn out, etc but you get out there and run it nonetheless. Your team is counting on you! For the road Ragnar in Las Vegas, we started at Mt Charleston running on the roads down the mountain. I got to run a bit on the highway into Las Vegas. What other time do you get to run on the highway? We traveled through the city and near Red Rock Canyon (a beautiful section that was unfortunately run at night). You run through the city itself more (but not the strip) and up along the beautiful River Mountain Loop trail by Lake Mead and into the finish at Lake Las Vegas. We ran mostly on the public roads with some paved trail mixed in there. I think I may enjoy the trail relay more than the road relay. You get to camp and enjoy beautiful trails. At Zion, we ran on mostly single track trail near Zion National Park. You camp in one spot (no traveling around in a van). Ragnar sets up a nice base camp with vendors. You get a tiny bit more sleep (every little bit helps!). There are fewer rules (especially regarding safety since it doesn’t involve vehicles and public roads). I do have some complaints about the relays. They are expensive! For example, our early registration for Las Vegas 2013 was $1,392 ($116 per runner). The registration fee alone is pricey. If you are traveling, you have to deal with those costs, plus van rentals. You can also end up spending on decorations, team shirts, etc. I understand that a relay race over such a distance would be expensive for everything that needs to put the event on though. If you do not travel, you have to deal with finding (or paying for) volunteers. After paying registration, you are required to provide volunteers for them! Also, there are little charges here and there along the course for food items, sleeping, etc. I understand some places use this for fundraising but as a participant you can get a bit of fee fatigue. Overall, I find Ragnar races to be a great experience and I would like to do more of them, especially at different locations. It really brings you closer to the people on your team. Although the cost can be high and the logistics of the race can be challenging, the experience outweighs the cons. I would recommend the event to anyone looking to test themselves in something new. Questions? Thoughts? Leave a comment.